With the cover showing the familiar Hudson’s Bay Company blanket coat, this book invites the reader to meet the Canadian Metis community. This is a dual language book, in English and Michif. Michif, according to the end notes, is a combination of the French and Cree languages used by Metis who lived in Western Canada. Eventually, the author (Order of Canada winner, David Bouchard) writes, he will “claim [the language] as his own,” a common refrain regarding learning his culture throughout the book. Metis history is significant to the Grade 8 study of Canadian history, specifically Opening the West. This picture book would be a good introduction to how the Europeans interacted with one of the aboriginal communities, and how that community fought to keep their language and culture alive. Much of the shame and denial of their heritage, which cuts across this book, lives on, described today by the author. Grade 6 students, who study First Nations, will be inspired by artist Dennis J. Weber’s evocative painting and illustrations. The recurring motif of the Hudson’s Bay coat reminds students of the close relationship between the great trading house of HBC and the First Nations, including the Metis. As an added bonus to this book, there is a CD read by David Bouchard in English highlighted with fiddle, pipe and drum music. The music is led by John Arcand. 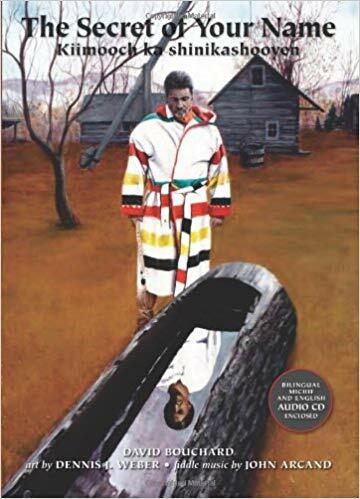 After the musical interlude, the book is reread, in Michif this time, by Bill Starling, which makes it possible to hear Michif spoken, if not understood. This book would be a valuable resource when studying First Nations.